** Originally published in the 1998 North American Crabbet Breeders Stallion Guide issue of the Crabbet Influence magazine. Our recent move to Eastern Oregon, so far East in fact we are almost in Idaho, has given us a whole new world of horses to explore. We decided to venture to Caldwell, ID, and watch the Country Classic Show put on by the Idaho Arabian Breeders Association (IABA) on September 6 & 7, 1997. We arrived in time for the last of the IABA Halter Futurity classes. The three year old fillies were assembled outside waiting their turn to enter the arena when a very nice chestnut filly caught my eye and impressed me as the type of horse I like. 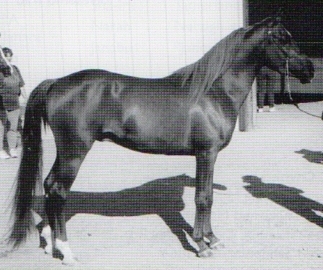 She was Aur Miss Vixen (pictured at the top of page in the article/header photo), owned and bred by Moon Shadow Arabians of Kuna, Idaho. I talked to her handler, Marty Houghton, and was pleased to learn the filly was an Aur-Fix daughter out of Miss Arriba. Somehow that Crabbet influence always sticks out! Moon Shadow Arabians had some very nice horses of predominately Crabbet breeding at the show. 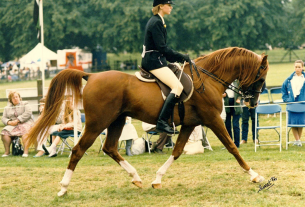 Their stallion, FV Silver Rabba, is a *Seyad son out of FV Aurabba, bred by David Ward. This stallion’s beauty was impressive, but more than that was his superb disposition as children stood around petting him. Moon Shadow horses were consistently in the ribbons, and MSA Fox Fire, by Aur-Fix out of Naborrs Fashion, won the stallion halter Championship on Sunday, with FV Silver Rabba placing Reserve. 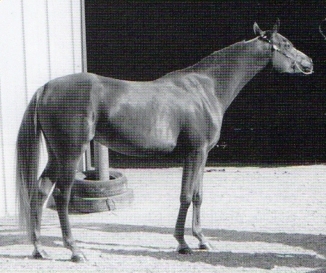 The three year old Futurity Champion Stallion was Belesemo Zaahar, shown by Jan Keely and owned by Clarice Miner. 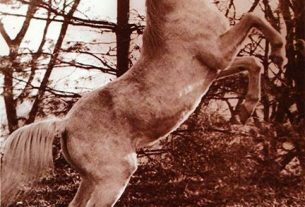 This young stallion was by Belesemo Magic out of ZA Zaahde Ladyhawk. Another Belesemo horse that could not be ignored was the eye-catching Pinto mare, Belesemo Baskcolour, owned and shown by Janice Sullivan. 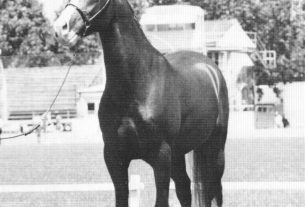 This striking mare by Belesemo Trad out of Baskett De Colour, won many classes in both halter and under saddle. The next surprise for me was finding a Khemosabi daughter, Khrema Wheat, who is out of Belesema Fantasia. 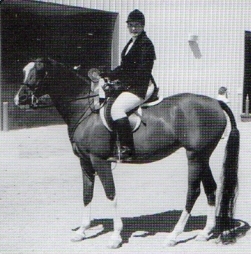 This lovely mare and her owner, Bonnie Dyas, won more than their share of classes. The Stallion Presentation was not only well planned but very well attended as all the seats were taken thirty minutes before it started! The arena became dark and the spotlight highlighted the entrance as the first horse came through the fog. This first horse was my personal favorite, and unfortunately my photo of him was not good, but Ben Rocky, by Ben Rabba out of Princes-Sherod, was breath-taking as he raced around the arena. The spotlighters had a challenge in keeping up with this guy! Not surprising to learn he is another Moon Shadow stallion. There were nineteen gorgeous stallions in the lineup, featuring the blood of Azraff, *Serafix, Comar Raffdazon, Ace and Abu Farwa, to name a few. Several stallions were straight Egyptian or Polish but most had some Crabbet in them somewhere, and was a great presentation followed by a silent bid auction on stallion services. I came away quite pleased with the quality of the horses and found the attitude of most of the people there was friendly and open. The atmosphere of the show itself was quite relaxed and fun. We had an enjoyable time, saw some beautiful horses and met some nice new folks. What better way to spend a weekend?